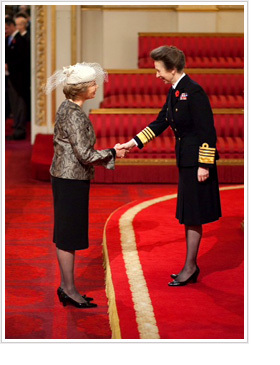 Peninah Thomson was appointed OBE for Services to Women and Equality in the Queen’s Birthday Honours, 2012. Previously a Partner at Praesta Partners LLP, one of the UK’s leading consultancies specialising in executive coaching, she is the Chief Executive of The Mentoring Foundation, the not-for-profit company which owns and manages the FTSE 100® Cross-Company Mentoring Executive Programme, in which more than sixty FTSE 100 Chairs and Chief Executives, and other senior leaders, mentor female executives from just below Board level at another company, to assist them in becoming credible candidates for executive and non-executive Board positions, and in otherwise progressing their careers. Having begun her career in the UK Foreign and Commonwealth Office, Peninah subsequently worked to the Board of NATO National Delegates in Paris, and has worked in 17 countries. She gained a First in English and French Literature at Oxford Brookes University and then pursued Doctoral studies at Lady Margaret Hall, University of Oxford. She joined PricewaterhouseCoopers’ Government Services Division, working at Cabinet Office level in the UK and abroad. She was seconded for two years to the UK Cabinet Office and subsequently became a Director in PwC’s Corporate Transformation Practice, working at Board level in FTSE 100 companies. Peninah served on the Strategy Group of Lady Margaret Hall, University of Oxford, and was a founding Steering Committee member of the 30% Club. She was a member of the UK Commissioner for Public Appointments Advisory Board, and is a UK Director of the Center for Talent Innovation, New York.